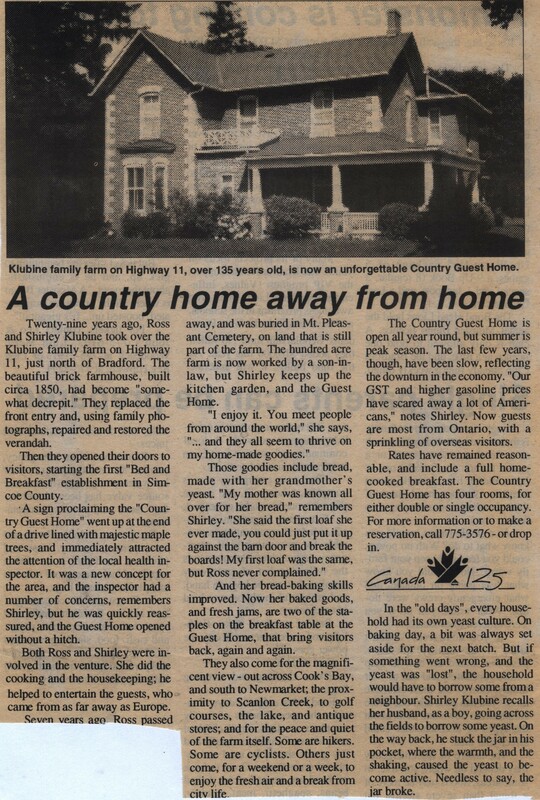 Description : Twenty-nine years ago, Ross and Shirley Klubine took over the Klubine family farm on Highway 11, just north of Bradford. The beautiful brick farmhouse, built circa 1850, had become "somewhat decrepit." They replaced the front entry and, using family photographs, repaired and restored the verandah. 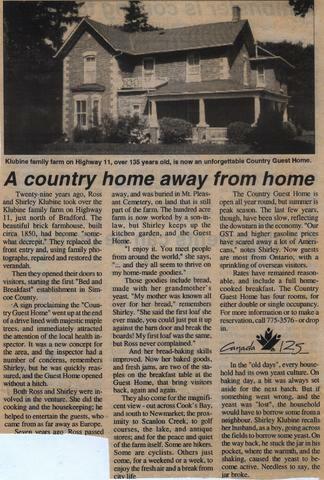 They opened their doors to visitors, starting the first "Bed and Breakfast" establishment in Simcoe County. A sign proclaiming the "Country Guest Home" went up at the end of a drive lined with majestic maple trees, and immediately attracted the attention of the local health inspector. Both Ross and Shirley were involved in the venture. Seven years ago Ross passed away, and was buried in Mt. Pleasant Cemetery, on land that is still part of the farm. Now her baked goods, and fresh jams, are two of the staples on the breakfast table at the Guest Home, that bring visitors back, again and again. The Country Guest Home is open all year round, but summer is the peak season. Rates have remained reasonable, and include a full home cooked breakfast.